Almost everyone from Roosevelt’s record-setting 2014 soccer season will be back this fall. Last year was a World Cup year, but the Roosevelt University community didn’t need to see games played 5,000 miles away to get excited about soccer. That’s because 2014 was also the year that the Roosevelt men’s soccer team established itself as a program to be reckoned with. What made the Lakers successful, and simultaneously fun to watch, was their unrelenting offensive attack. Whereas soccer is often criticized for its low-scoring affairs, Roosevelt tallied nearly four goals a game, an almost unheard of average that ranked second to only national runner-up Texas at Brownsville in the NAIA statistical rankings. Those high-scoring fireworks were propelled by a pair of highly-touted newcomers, Evan Trychta and Jose Garcia, who lived up to the hype. Trychta, Illinois’ best high school soccer player as a senior at Naperville North in 2011, began his collegiate career with limited playing time at the University of Illinois at Chicago, a Division I program. But his career was rejuvenated by transferring to Roosevelt. The quick, powerful frontman scored a school-record 17 goals to go along with 12 assists for 46 points in 2014, making him one of the top 10 point producers in the NAIA. The other star Brennan recruited was Garcia, the Chicago Sun-Times’ player of the year in 2013. Garcia led Wheeling High School to the Class 3A state title game as a senior. In Garcia’s first season at Roosevelt, he scored 15 goals and an all-time team best 15 assists, coming up just one point short of Trychta’s offensive total. First-year offensive stars Jose Garcia (left) and Evan Trychta (right) combined to score 32 goals and assist on 27 others for the Lakers last season. Their on-field success earned Trychta All-Chicagoland Collegiate Athletic Conference (CCAC) First Team honors and Garcia the conference’s Freshman of the Year award. While the offense garnered all the attention, the defense wasn’t too shabby either. Behind Curie High School product and two-time All-CCAC Second Team defensive captain Luis Ortiz and junior goalkeeper Jake Cigelnik from Mundelein, the Lakers allowed just 24 goals in 19 matches and recorded a school-record eight shutouts, a mark of goal-less play that ranked 25th in the NAIA. After starting the year with two close defeats, the Lakers rattled off 11 consecutive victories that propelled them to first place in the CCAC. Near the end of that streak, junior co-captain Leo Rodriguez, who tallied 12 goals in the Lakers’ first 12 games, suffered a knee injury that sidelined him for the rest of the regular season. The winning streak was snapped shortly after Rodriguez’s injury in a late double-overtime loss to Purdue Calumet, but the Lakers remained in good shape heading into the CCAC Tournament with Rodriguez rehabbing to play in the postseason. The postseason is where the Lakers encountered Purdue Calumet once again, and the two teams engaged in a spirited first-round playoff game at UIC’s Flames Field in front of an enthusiastic crowd that braved the November chill. Roosevelt rallied from two goals down early thanks to strikes by Garcia and fellow freshman Marino Lopez, and the match turned into a stalemate that lasted 110 minutes. The game finally ended with penalty kicks. Unfortunately for the Lakers, the usually reliable Garcia missed his kick and the Peregrines outlasted the Lakers 4-3 to end Roosevelt’s best season to date. Brennan will have most of his roster back for the program’s fourth season since its revival in 2012, a year in which the Lakers won just two of 18 matches and scored five fewer goals than Trychta tallied on his own. 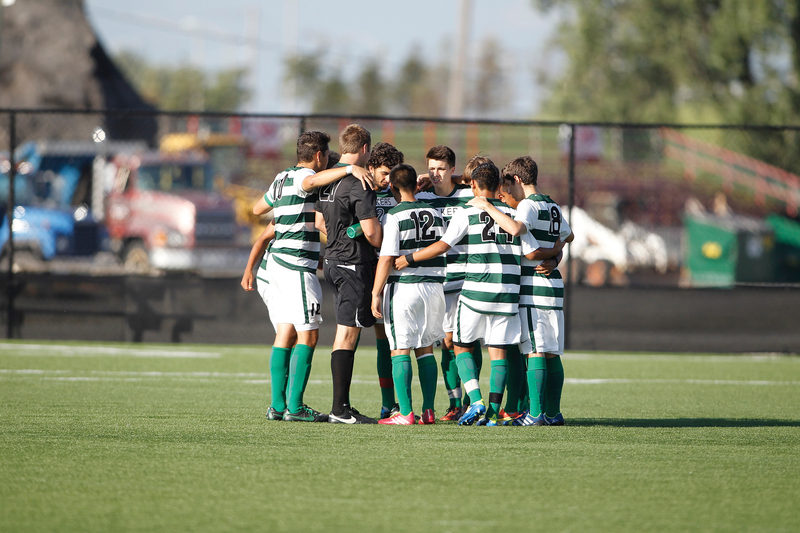 “Our goal,” said Brennan, “is to win the CCAC championship in 2015 and, hopefully, give these players memories and a bond that will last a lifetime.” 2015 is not a World Cup year, but it is a year that has Roosevelt University even more excited about soccer.